You have an amazing offer that you’re ready to share with the world. Your landing page is up. But the video … errrr .. it’s not quite there yet. Maybe you’re starting to think that you don’t really need a video and a photo of your smiling face will do. Well, before you put the kaibosh on your video plans, let’s run through some of the fundamentals that you need to have in place so you have a clear video game plan when it comes time to shoot. Remember, the whole point of this video is to capture interest and give your viewers a sense of excitement of what’s to come. Not to explain the rest of your video series, not to explain all the details your offer, and definitely not to talk about yourself for 3 minutes. There is SO much power to speaking directly to your viewer right off the top, so always start your videos with a question or bold statement that speaks to what your target audience is thinking. I’ll give you a hint: what’s the #1 question on their minds right now? Got it? Okay good. Now use question in your hook. Don’t rush into it. Just like how a great copywriter could spend days thinking of the perfect headline, your video hook should be a same. It immediately creates connection and intrigue and makes them think, “yea, this girl (or guy) really knows what I’m experiencing. I think I’ll stick around to see what they have to say.” A powerful hook doesn’t have to be with words either. The words you use can have a big impact on how you connect with your audience, but so does the overall look of your video. This is a small detail but SO important and I’ve seen so many people do this incorrectly. The distance of your camera will depend on your camera type and your lens, but generally, you’ll want a nice comfortable crop right around your chest or elbows, to just above your head. If you’re too far, you risk making your audience feel like they’re disconnected from you, and too close … well, think of being stuck in between floors on a full elevator. You risk making your viewers feel a little clausterphobic. You’ll also always want to make sure your camera is at eye level or just slightly above. No one looks cute looking down at a camera, and I know it’s easiest to place that camera on your desk and just shoot, but try propping it up on some books and you’ll notice immediately that your video feels (*inhale*) more open 🙂 You can check out this post, you want a full run-down of How to Shoot an Amazing Self Interview. Or even shorter if possible. Remember, the only thing you want to accomplish in this video is to create excitement and intrigue. Start with your hook, a brief sentence about yourself and then 3 key benefits that your viewer will get out of opting into your offer. You don’t have to explain how the series will work, save that for your email copy or for the next video in your launch series. Really take the time to get clear on what your driving benefits are, then use simple and clear language that clearly communicates the value you want to deliver. Be choosy with the words. No need to get fancy or too jargoney (is that even a word?). You know what I mean 🙂 You don’t have to worry about losing viewers by not providing enough information. In fact, just the opposite is true. Once you start providing too much, you risk losing the attention of your viewers. If you’re launching a digital product like an e-book or an online course, you can build a lot of trust and answer a lot of questions just by giving a glimpse of what’s inside. 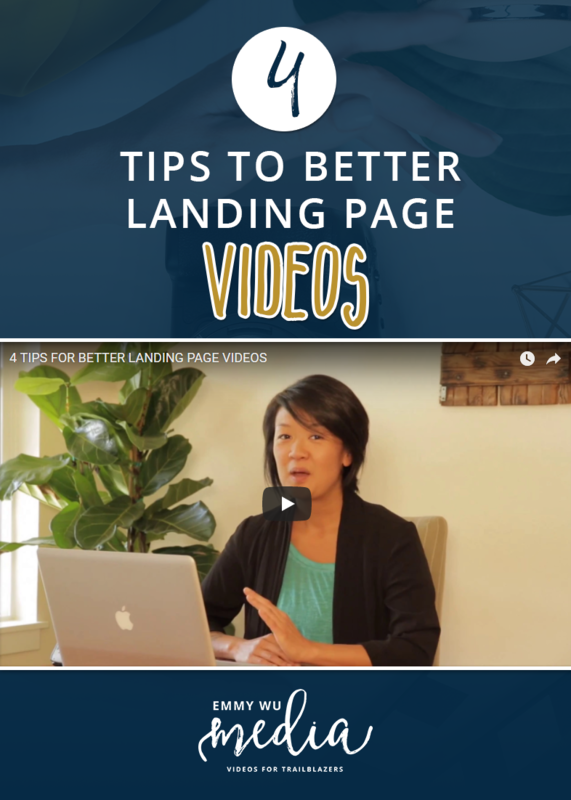 You can use programs like Screenflow or Camtasia to record your screen and use it as b-roll in your landing page video. Think of how cool it would be to talk about 8 Modules, but then also give your viewers a quick visual of what it’s like inside your digital classroom? Or show them sneak preview of e-book even before they purchase it. Not only do you create a much more visually dynamic video when you show, instead of tell, but you’re also making your video a lot more memorable. People won’t remember all the words you use, but they’ll remember that they loved the overall feeling of your brand, and that’s exactly what we’re aiming for in your videos! These are wonderful tips. When I get up the nerve to actually appear in a video I will take your advice. Thank you Shauna! Showing your face on camera is SO powerful for connecting with you audience. You’ve got this! Loved this video. So many great tips – and in just a few minutes. You really “do” what you “say” Thanks Emmy! I want to launch an online course for making awesome warm Snow Skirts. I have a pattern for a girl’s size snow skirt and am thinking I could do a quick free course for the girls one and offer the Adult course for purchase. Or maybe just 3 short videos with simple tricks and tips and then offer the course for purchase. Not sure. But you sure make me feel like I can do this!!! Emmy Wu, you rock! Thank you so much for what you do – you have changed my thoughts on using video for my website from terror to “hey I might actually be able to pull this off!” I’m preparing to launch a year-long Weight Loss program for women who are beginners (or begin-again-ers). I’m currently working on the Opt-In to build my list prior to the launch: How to Drink Wine and Lose Weight too. It is a 4-part series that I was going to do all in writing/print, but I’m going to (try to) use your tips and add video. I love the idea of the B-Roll footage, and the tip about spacing/framing is something that I have been wondering about, so thank you!